State Of The Art Illuminating Technology Applied To Medical X-ray Viewing. 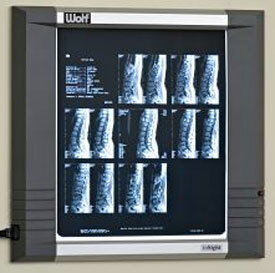 The new inSight Illuminator from Wolf X-ray utilizes LCD TV technology to bring you an x-ray viewbox with a uniquely even light surface in a super-thin cabinet. Projecting two inches from the wall, it is so thin that Wolf does not offer it in a recessed version. 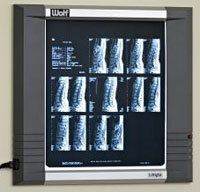 Available as a single unit, two in one and four in one each panel accomodates up to one 14 x 17" x-ray. A rocker switch on the right side of the unit turns the viewing surface on and off, and an auto switch is incorporated in the film grip that automatically turns the unit on when a film is inserted. The inSight comes with a one year warranty for defects in parts or manufacturing, and like all Wolf products is backed by their 75 years of service to the medical imaging community. 21" x 19 5/8" x 1 5/8" 35" x 19 5/8" x 1 5/8" 53" x 19 5/8" x 1 5/8"
14" x 17" - 1 pc. 14 1/8" x 17" 28" x 17" 56" x 17"